While reading Keep on Running, (1) I came across something interesting about using a pre-run drink to boost performance for middle distance runs (which are around 1 mile long). Consuming a carbohydrate/protein drink (e.g., Gatorade and BCAAs) before a 1.5-mile run could boost the amount of adenosine triphosphate (ATP) that your body can generate during your run, as well as making you more alert and engaged, both of which can decrease your run times. Cells use ATP when they need energy. As such, ATP is often equated to currency: Energy is "spent" when enzymes transform ATP into adenosine diphosphate (ADP); energy is "saved" when primary fuels like glycogen or fatty acids are used to transform ADP back into ATP. The authors of Keep on Running argue that when fatty acids are present in the blood the human body prefers to use fatty acids instead of glycogen (the stored form of glucose) to make ATP. Unfortunately, compared to glycogen, fatty acids require 10% more oxygen to produce the same amount of ATP. Fatty acids are also metabolized at half the rate of glycogen. What does all of this mean for your 1.5-mile run performance? During your run, if you are already using all of the oxygen possible (max VO2), then using fatty acids to create ATP, instead of glycogen, will result in a slower average pace. However, if you consume a sugar drink 60-120 minutes before a run, you can use insulin to temporarily prevent fatty acids from being released. Normally, when insulin is present in the blood, fatty acids are trapped in adipose tissue (fat storage). During your run, this means that your body will have less interference from fatty acids to more efficiently produce ATP from glycogen (and possibly decreasing your run time). BCAAs can Prevent "Mental Relaxation"
Of the 20 different types of amino acid that can make up protein, three can be burned directly by muscle cells. These amino acids (valine, leucine, and isoleucine) are called branched-chain amino acids (BCAAs). As you run (or engage in any exercise), your muscles can burn too many of these BCAAs. As blood levels of these BCAAs drop, more of another amino acid--tryptophan--is allowed to enter the brain. As more tryptophan enters the brain, the level of serotonin increases, resulting in increased tiredness and improved mood. During your 1.5-mile run, experiencing more tiredness and less aggression can make it harder for you to push yourself to maintain your goal pace. You can temporarily prevent this situation by consuming BCAAs just before your run. This will flood your body with BCAAs, preventing more tryptophan from affecting your commitment to a faster--and more painful--pace. When Should You Consume this Drink? If consumed too close to your run, insulin can inhibit glycogen breakdown in the muscle and cause an unpleasant drop in blood sugar levels (a.k.a., hypoglycemia), hindering performance. BCAAs are absorbed very quickly--within 30 minutes after taking it--and can remain in the blood for up to 3 hours. After this 3-hour period, the consumed BCAAs will no longer affect your running performance. Because everyone is different, you will have to experiment with exactly how long, after ingesting this drink, to wait to start running (e.g., 60, 90, 120 min). Note: After you determine the best time to consume your pre-run drink, then this drink should ONLY be consumed before a PT test. 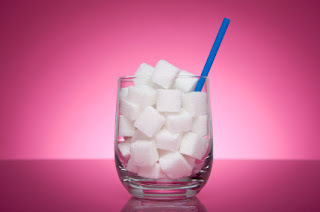 Consuming sugar drinks recreationally will encourage you to overeat and possibly limit how much fat you can burn during your exercise sessions, both of which can make it difficult for you to maintain your goal body weight. 1. Newsholme, Eric, Leech, Tony and Duester, Glenda. Keep on Running. New York : John Wiley & Sons, 1998. Your body uses all three types of macro no matter what you do. It is more likely to utilize more of one than another depending on what you do (type of exercise). Fruits lack a complete protein and even if it were its not a sizable amount. I think if you want to maximize your ability to maintain muscle while benefiting from your recent energy exertion a variation of sugars and proteins should be consumed. Ideally, protein takes awhile to break down, so aminos tend to be a better route, but they combat with HCA, so the bio-availability decreases. Enteric coating can help. Back to sugars, I do prefer fruit. They contain several sugars in which fructose is one which the liver does its thing on so you have different digestion rates, with a bonus, vitamins and minerals. I would though choose wisely, and get the less fiberous stuff. This is true: Your body uses carbohydrates, fats, and (to a lesser extent) protein to fuel your physical activities, but your body prefers to burn fatty acids. Unfortunately, fatty acids require 10% more oxygen to metabolize, and the rate of energy release is half that of glycogen. So, as your body uses more and more fatty acids during your run, your pace will get slower. This means that if you want to set a faster pace, then you want to prevent the body from metabolizing fatty acids during your run (which will allow you to use more glycogen, a "higher-octane" fuel compared to fatty acids). Sugar, and its temporary affect on insulin, can trap fat in storage during your run, leaving your body no option but to use your glycogen. @Jason - ALL fruits (at least those that are commonly eaten and are in the USDA database*) contain all 9 essential amino acids. If you eat enough of the fruit, then you will get enough total protein. Stop being carb-phobic by eating only one or two pieces of fruit... Aim for 1000-3000 kcal per meal of fruit, depending on your activity level. Consuming sweet fruit is the only natural/Paleo/Primal way of doing what this silly HIGHLY processed drink does. *Mangoes and guava MAY lack cysteine (or just incomplete data set) which is considered conditionally essential. There does not appear to be any amino acid data for pomegranate seeds. If you get a variety of fruits throughout the year, you will be fine.